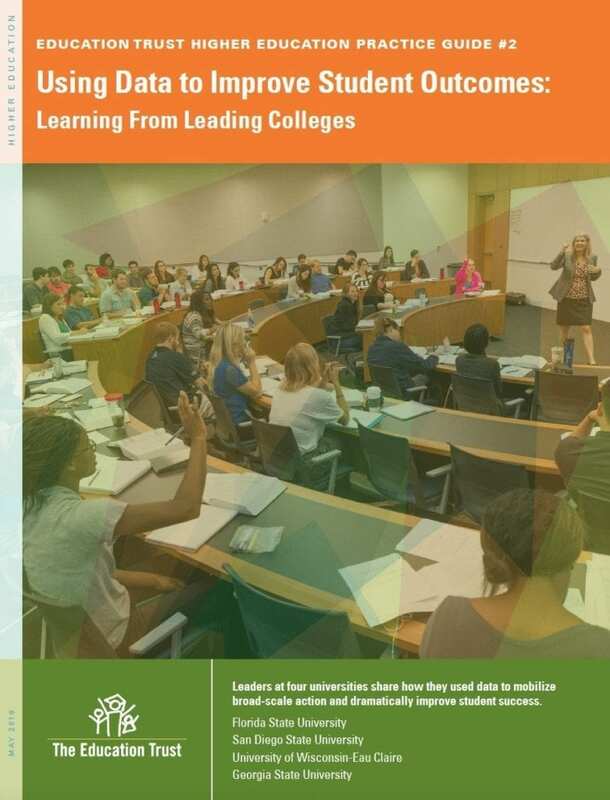 Using Data to Improve Student Outcomes: Learning From Leading Colleges is a guide to inform university leaders and others steeped in efforts to raise graduation rates on their campuses. It highlights leading universities that have drastically improved student success by consistently reviewing and using their own data to launch campus-wide initiatives, focus the entire college community on student success, and remove stubborn obstacles that impede large numbers of low-income students and students of color from graduating college with a degree in hand. Florida State University, where the graduation rate for underrepresented minorities (URMs) rose from 60 to 75 percent between 2002 and 2013. The proportion of Pell Grant recipients enrolled went up during that time too — from 19 percent to 27 percent. San Diego State University had 31 percent of Latino students graduate in 2002, but that number nearly doubled to 60 percent when students donned their tassels in 2013. University of Wisconsin–Eau Claire saw 53 percent of URMs graduate in 2013 — a jump of 17 percentage points from 2002. Georgia State University, where graduation rates for URMs continue to grow, from 32 percent in 2002 to 56 percent in 2013. University leaders and others concerned about improving student success can also turn to Ed Trust’s College Results Online, an interactive web tool recently refreshed with the latest data on college graduation rates, net price, and student outcomes for nearly every four-year college and university in the country. The tool also includes four new metrics on student outcomes, including 10-year post-enrollment earnings of the 2001-2002 enrollment cohort, the percent of those earning more than $25,000 per year 10 years after entry, the median federal student loan debt of completers, and the loan repayment rate of students five years after completing.